On the crisp, clear evening of Tuesday, March 1, 2016, they crouched down by the walls to etch names onto paper, their colleagues providing extra light from their smartphones. They came to pay their respects to their fellow officers before graduating from the academy the following week. Jeff McCormick, of the FBI, invited them to the middle of the Memorial and started the program by reminding them of the ultimate sacrifice the fallen officers made. He was followed by the National Anthem, sung by two officers from the New York City Police Department. Memorial Fund Chairman and CEO Craig W. Floyd began his remarks by reminding the crowd of the numerous recent killings of police officers, including Ashley Guindon, who was eulogized at a funeral service that afternoon in nearby Prince William County, Virginia. The negative image and public scrutiny that has been plaguing law enforcement in recent years was also addressed. Floyd closed his speech by telling the members about the plans to open the National Law Enforcement Museum in 2018. Financing for the Museum was secured in late-January and construction is expected to start later this month. 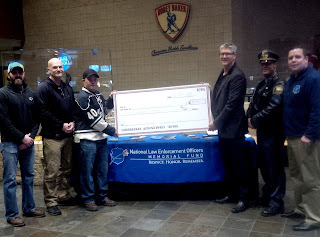 On Tuesday, February 23, 2016, more than 400 law enforcement officers joined the Minnesota Wild for their inaugural law enforcement appreciation night at the Xcel Energy Center in St. Paul, Minnesota. This special night was dedicated to honoring and recognizing those that make up Minnesota’s thin blue line, thousands of law enforcement officers committed to public safety. 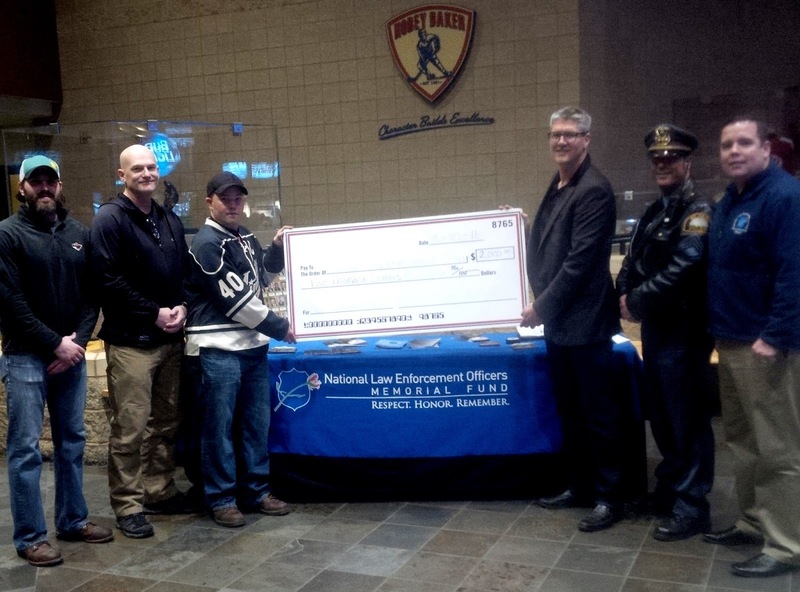 Those who purchased their ticket through the special offer received a National Law Enforcement Officers Memorial Fund hockey puck, a discounted ticket to the game, the opportunity to take a picture on the ice and a special VIP party in the Bud Light Fan Zone. The Minnesota Wild came up short in a tough 4-1 loss to the New York Islanders. Due to high demand, the event sold out and the Minnesota Wild have put together another special offer for March 31, when the Wild take on the Ottawa Senators. We would like to thank everyone who attended, with special thanks to Lindsay Weier and the Wild Group Sales Team, the Minnesota Association of Chiefs of Police, the Minnesota FOP, Minnesota Sheriffs Association, Law Enforcement Labor Services of Minnesota and the Federal Law Enforcement Officers Association.